The US Congress does not want NASA to consider any manned mission to Mars. They are writing this ban into HR 3093, an appropriations bill that includes NASA's 2008 budget. The bill states that NASA may not pursue "development or demonstration activity related exclusively to Human Exploration of Mars." The language of the bill goes on to say why... "NASA has too much on its plate already, and the President is welcome to include adequate funding for the Human Mars Initiative in a budget amendment or subsequent year funding requests." So, all President Bush has to do is fund Mars missions separately? Is that really the whole story? I suspected not. Congressman Barney Frank (D MA) has pushed to add anti-Mars language to appropriations bills in 2005 and 2006. In 2005, he wrote "I agree about what was said about aeronautics; it is so important. I agree with space experimentation, primarily unmanned. But sending human beings to Mars, which this bill unfortunately endorses, is an extravagance…". In 2006 he moved to add the language, "None of the funds made available by this Act may be used for a manned space mission to Mars." So, it would seem that Congressman Frank wants NASA to be frugal with taxpayers' money, and views any manned Mars mission as a boondoggle. I decided to seek out Harvey Kurtz, a former NASA employee and Mars expert fired in the 1980s for refusing to participate in a cover-up of the Viking mission's findings, especially its most sensational finding: the existence of life on the red planet. 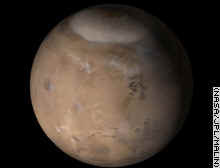 Kurtz has revealed much to me and to The Uncoveror in the past, such as the fact that Martians call themselves the Zhti Ti Kofft and live deep under the planet's surface. Kurtz is not an easy man to get in touch with, as he is convinced that NASA is still out to get him. I made several attempts to contact him, eventually reaching a voice mail box. I left a message asking whether cutting fat out of the budget was the only reason Barney Frank is so against sending astronauts to Mars. For a considerable time I heard nothing, but earlier today I got a text message saying: "NO. HE HAS MET KOFFT. 3 OTHERS IN DC AS WELL" I tried immediately to reach him for more detail, but he had gone back underground. If the Zhit Ti Kofft really have warned our leaders to stay off of their planet, and we don't listen, what are we risking? Would they just kill our astronauts as they shot down our probes, or make War Of The Worlds a reality? I do not want to find out.